Last night’s Community revisited the brilliant paintball episode, but the episode was distinctive for another reason, too: The title broke the show’s naming conventions. 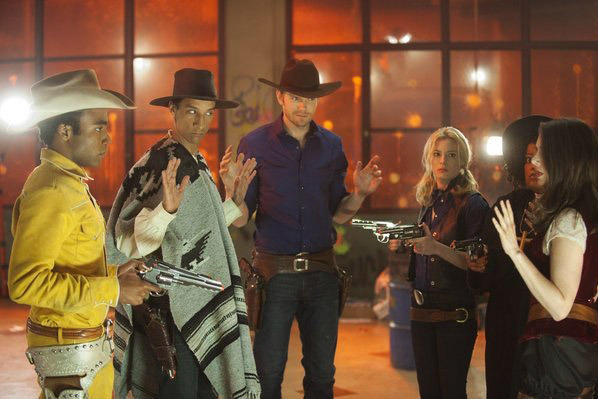 “A Fistful of Paintballs” doesn’t fit with Community’s pattern of naming episodes after college classes — “Intro to Political Science,” “Beginner Pottery,” “Anthropology 101,” etc. The only other episode to break with tradition was “Abed’s Uncontrollable Christmas.” And that one was Claymation! An episode-naming formula isn’t new: Seinfeld always went with a terse, two-word “The ___” title (The Puffy Shirt, The Bris, The Raincoats…) while Friends went meta with their “The One With ____” construction. But those were exceptions: Now it’s the prevailing trend for a series to come up with some sort of running theme, be it puns, repeating structure, or omnipresent words. Let’s take a brief survey of the various formulas currently going on TV. Chuck’s “Chuck versus ___” are often about the literal foes he’s battling (“Chuck Versus the Ring”) but are sometimes about the emotional growth he’s struggling with (“Chuck Versus the Three Little Words”). Hawaii Five-0’s Hawaiian titles don’t follow a convention themselves — “Palekaiko” means paradise, “Ma Ke Kahakai” means shore — but hey, they are in Hawaiian. Law & Order: Los Angeles uses L.A. neighborhoods — “Silver Lake,” “Runyon Canyon” — perhaps to help shed the series’ New York origins. Better With You’s “Better With ___” (“Better With a Leather Jacket,” “Better with a Cat”) is the only naming convention for an ABC comedy. The Mentalist has “red” in every title, as an allusion to the show’s central serial killer, Red John. Sometimes the titles use code (“18-5-4” becomes R-E-D), and sometimes they use synonyms (“Rose-Colored Glasses”). The Big Bang Theory uses fake science terms for its titles: polarizations, paradoxes, conundrums, hypotheses, etc. But they might never top “The Zazzy Substitution,” just because it’s so zazzy. Grey’s Anatomy uses song titles as the titles for its episodes, which is a convention also employed by Degrassi: The Next Generation and One Tree Hill. Desperate Housewives uses Sondheim lyrics for its titles, and even while the show has floundered, lines like “My Husband, the Pig” and “I’ll Swallow Poison on Sunday” have stayed strong. Law & Order: Special Victims Unit uses one-word titles, and somehow managed to go eleven whole seasons before it used “Penetration.” Smallville also uses one-word titles but has not used “Penetration.” Yet.